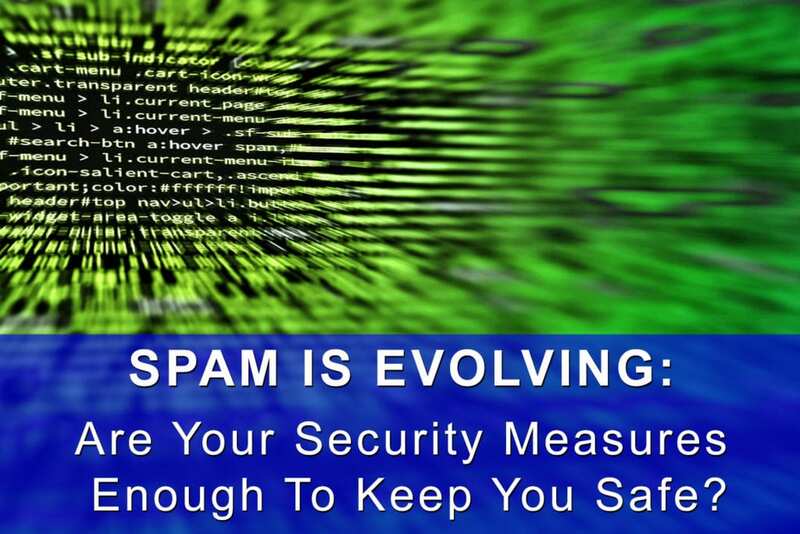 SPAM is Evolving – Are You Safe? The one constant in life is change, and that’s certainly true when it comes to technology. Unfortunately, it’s also true when it comes to cyberattacks on our computer systems. Cyberattacks have evolved and are often “fileless”. The red flags and suspect attachments that we’ve gotten better at spotting over the years may not be there to alert us to danger. A whopping 75% of successful attacks on companies used fileless techniques, according to a recent Poneman Institute Study. That, combined with the fact that approximately half of companies experience one or more successful attacks should be enough to make your hair stand on end – particularly if you haven’t taken stock of your computer systems security methods lately. If your sole protection against attacks is antivirus, it’s probably not enough to protect you. There is an additional tier of protection that you can put in place to give yourself a fighting chance against the computer-based bad guys of the world: Cloud-based SPAM filtering. Our favorite SPAM Filtering service is FuseMail. Why is a Cloud-Based Filter Better Than Just Using an App on Your Computer? Anti-virus apps are often purchased per computer, and those costs can add up. Perhaps more importantly, a computer has to be on and running to filter the emails – this is neither efficient or completely effective. FuseMail’s cloud-based SPAM filtering service filters the emails of all users at a company before the emails are ever forwarded to the company’s mail server. This extra step protects the company’s mail server, computer workstations, and related mobile devices. Bonus perk: FuseMail’s service includes Continuity Service. Continuity Service is a digital holding container that stores your emails for up to 2 days in the event your email server goes down or is otherwise offline. The emails are then sent to you when your mail server comes back online. It also gives you a web interface where you can read and respond to the emails that are in the holding container while your mail server is down. Everyone – and every company – excels in different areas. None of us can master everything, so pairing up with experts in their respective fields is essential. If you’re tasked with ensuring the digital security and efficiency of your company’s computer systems and processes, but aren’t a “techie,” calling in CompuTech Support Services is an excellent business decision. Let us come in and help you by doing what we do best, so you can get back to doing what you do best. We can set you up with the FuseMail cloud-based SPAM filtering service and can recommend other systems to streamline your workflow.